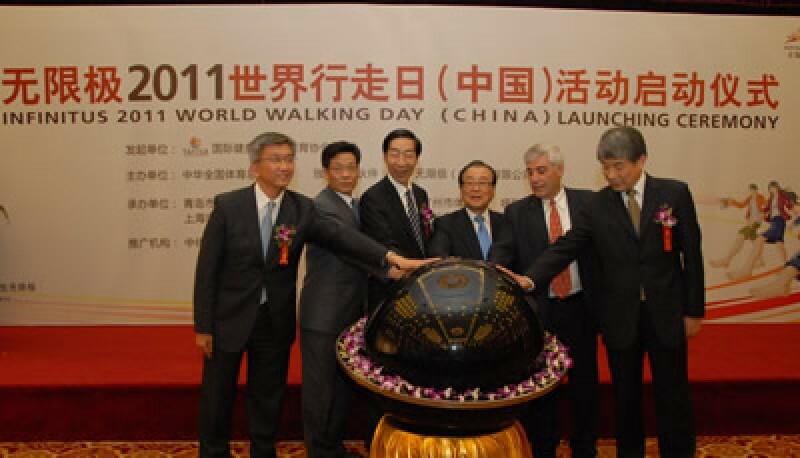 The launching ceremony of the World Walking Day 2011 (China) was held in Qingdao, China on April 15th. This event is launched by TAFISA, organized by China All-Sport Federation and sport bureaus of some provinces. TAFISA president Dr. Kang-Too Lee, ASFAA President Mr. Feng Jianzhong, ASFAA secretary general Mr. Herzel Hagay and Qingdao City government officials attend the ceremony. Last year, there were about 60,000 people participated in World Walking Day. This year, from April to November, World Walking Day (China) will be held in 12 cities, and around 100,000 people are expected to participate. Dr. Kang-Too Lee and Mr. Herzel Hagay attended the first station in Qingdao on Apr 16th, and successfully finished the whole journey.